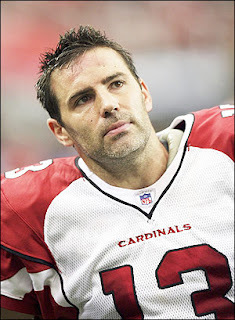 The NFL announced Sunday that Arizona Cardinals quarterback Kurt Warner has won its Walter Payton Man of the Year award. The honor was made before the start of Super Bowl XLIII at Raymond James Stadium in Tampa, where the Cardinals faced the Pittsburgh Steelers. "I am humbled the Lord has given me such an amazing life to impact others," Warner said. "Of all the awards given to NFL athletes, the Walter Payton Man of the Year is the one that stands out above the rest to me because of what it represents. When people look back at my career I want them to see a fierce competitor, but more importantly, I want to be remembered for my consistency of character." NFL Commissioner Roger Goodell and Connie Payton, the wife of the late Chicago Bears running back, presented the award, the only league recognition that acknowledges a player's off-the-field community service as well as his playing excellence.